All Estate Items will sell individually starting at 10am at the 1410 Tornado Dr. Church Point, LA Home location. Real Estate SELLING AT 12PM ON Saturday, 9/30. Lot 301 - Beautiful Family Property on 6.5 +/- Acres with a 3500 SQ FT (4) Bedroom and (2.5) Bathrooms, Huge Laundry Room and Family Room off the Covered Pool Area with an exterior bathroom and storage. Whole House Generator (Recently added), Barn w/Chicken Pens, and Mature Trees. SELLING AT 12PM ON Saturday, 9/30. 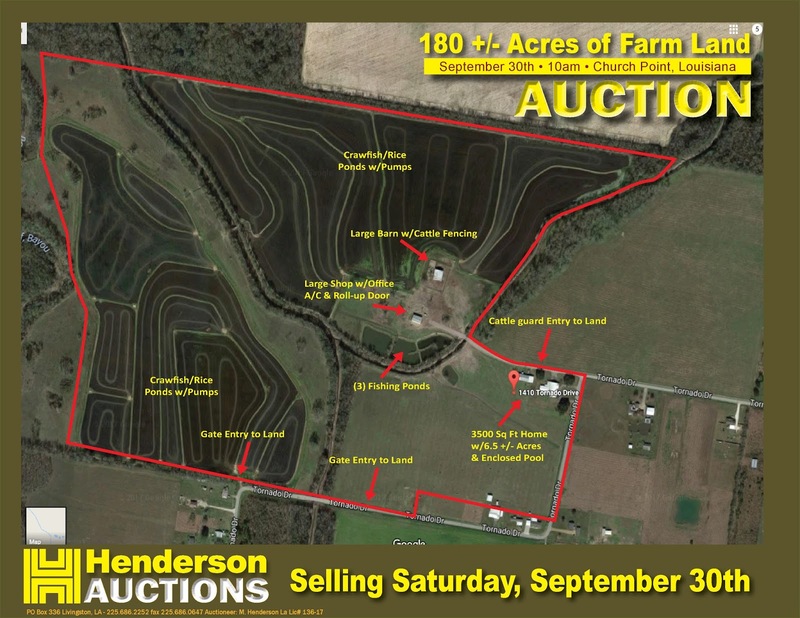 Lot 302 - Approx.175 +/- Acres of Farm Land with livestock areas, rice/crawfish ponds (includes pumps), Barn and Large Shop w/A/C in the office/man cave area, multiple right of ways on Tornado Dr. (w/gates), (3) Large Fishing Ponds and (1) Small Fishing Pond. Pending 13 year Grazing Lease on 60 acres of the property. SELLING AT 12PM ON Saturday, 9/30. Crawfish/Rice was farmed/leased up until June 2016, crop yields are unknown., there is no Phase 1or survey, you will get a clear title on the property, well pumps were working properly in June 2016 but have not been in use since then, you have (4) ROW’s to the property, winning bidder will have the mineral rights to the property. 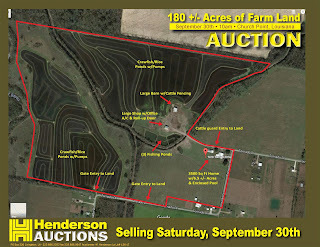 • Real Estate Buyer’s Premium: A Buyer’s Premium of Ten Percent (10%) will be added to the high bid on both real estate lots (6.5+/- Acres w/3500 SQ FT Home & 175+/- Acres of Farm Land. Their sum will constitute the Total Purchase Price on the purchase agreement. Example: if the auctioneer closes the bidding at $200,000 an additional $20,000 will be added to the purchase agreement total price (total purchase price example: $220,000). Elite Realty Group/Tiphanie Clark Brok. 0000076653 will be on-site with the real estate purchase agreements. Real Estate Winning Bidders will be required to pay a 10% deposit down due on (September 30th, 2017) after signing the purchase agreement. The balance will be due in 30-45 days unless agreed upon by auctioneer and buyer. *The ten percent deposit is non-refundable. 3% Fee Applies to Credit Card Purchases. Internet Bidding 3% additional charge on the Total Purchase Price. • Estate Item Buyer’s Premium: A Buyer’s Premium of Fifteen Percent (15%) will be added to the high bid on each estate item (guns, collectables, etc...example: If you are the winning bidder on a gun that closes the bidding at $300 an additional $45 will be added to the $300 + sales tax for the total purchase amount). Full settlement is due on the day of sale (9/30). Cash, Cashier’s Check/Money Order, Personal/ Business Check with bank letter of guarantee-accepted payments (Click Here for an example of a Bank Letter of Guarantee). Visa, Mastercard, Discover, American Express (3% Fee Applies to Credit Card Purchases). Internet Bidding Available (Additional 3% Fee). Sales Tax Applied when applicable. Estate Items must be removed from the property on Saturday, September 30th. If you need additional load-out days they will need to be scheduled. • The properties and estate items are being sold “as is, where is, with all faults”. You must rely on your own inspection and judgment when bidding on these items. • The properties are NOT being sold with a financing contingency. • You may also bid by phone, please call at least 24 hours in advance to set up phone bidding 800-850-2252, 225-686-2252 or 225-329-5304. This property is selling subject to the estate owners confirmation.